This is one of the first turkeys I ever put in the freezer. 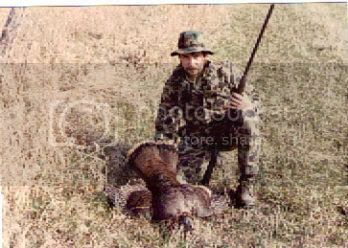 At the time we were hunting in the Fairview area, better know as the “turkey capital of Michigan.” We were just fledglings at the sport of hunting these birds, as we thought you could hunt them like you do pheasants. We had been seeing some birds hanging around a grassy/dried up swampy area, and figured we’d drive it like a stubble field. The four of us spread out across the field and started our march toward the other end. Just before we ran out of real estate two turkeys took to flight, and scared the dog fur out of me! I pulled up on the bird closest to me as my brother Darryl is hollering “hen-hen!” I was still on the bird as it started to fly up and over a small patch of woods, when he yelled “that ones got a beard it’s a Tom!” Boom! My model 870 rang out, and I dropped that bird at near 60 yards! (Honest) Sure enough Darryl was right; this little Tom had about a 4″ beard. He wasn’t as colorful as I expected, but I was elated to fill my tag, and put meat in the freezer. As I was cleaning the bird, back at the cabin, I pulled out something very strange from it’s innards. They looked like eggs! I called my brother over and asked “whats this?” He was as confused as I was, cause this bird defiantly had a visible 4″ beard. We both thought “Boy did we screw up!” I went into the cabin and called the Mio D.N.R. field office, and explained the situation to the officer I had on the phone. He told me to read my turkey hunting regulations, and I would find where they changed the wording from “one male (Tom) turkey” to “One bearded turkey.” He explained that in previous years they had run into this same problem, thus the word change to the regulations. He said it was rare, but bearded ladies (hens) are taken every year. I was relieved that my “Tom,” who was really a “Bearded Lady”, was a legal addition to my wild game menu. Birdies, And Eagles, And Pars Oh My! 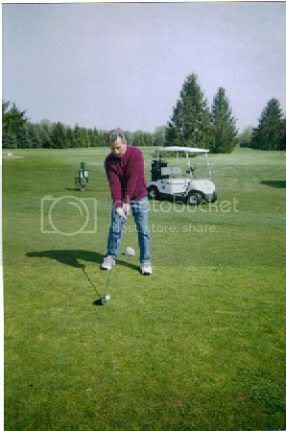 Any sport that has “birdies” and “eagles” as part of it’s scoring system has got to be good-right!� This is my golf partner Ed Ponzy getting ready for a typical 275 yard drive.� Ed is a golf fanatic, and these Michigan winters drive him crazy, cause he misses golf so much!� I’m sure if he could figure out a way to spend winters in Florida, he would.� You don’t have to be around Ed long, and the subject of golf will come up.� Ed’s quite knowledgeable about the sport, and has helped my game alot. Ed’s desire has always been to shoot one par game before he has to hang up his clubs.� Of course that’s every serious duffer’s dream, but most of us realize it is beyond our grasp. � Well this past season Ed reached that milestone and then some!� My old buddy shot a 2-under par 68 at Deme Acres in Petersburg Michigan much to his delight.� Guess what though?� Do you think he’s satisfied?� Not hardly!� Ed missed a couple shots on that 68 round, so he naturally thinks he can do better.� Eds new goal is now to break 68.� With his grit and determination I’m betting on him to do it.� Looking forward to this Spring and getting back on the links. This is just about the time of year I start getting excited for a round of golf.� I’ve only been playing for four years, but I thoroughly enjoy the game-well most of the time!� When my softball days were over my buddy Ed Ponzy talked me into trying golf.� I’m not sure if he just wanted to sell me his “cobra clubs” or if he truly saw potential in me, but we have played together ever since.� He’s a great teacher, and has got me down to a 13 handicap.� The first year I played I averaged about 28 over par for 18 holes! 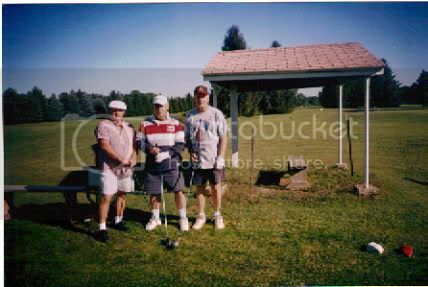 We are members at a beautiful 18 hole course in south western Monroe County called Deme Acres.� Most fairways are lined with 20-25 foot pine trees, and one would swear he was playing up north.� We’ve seen flocks of turkeys, deer, and even eagles on the course.� We also see our share of squirrels, ducks, geese, rabbits, and turtles while we make our rounds.� The owners (Jim and Carrol) are two of the nicest people you could meet, and have a good crew keeping the course in top shape. I hate to think I’ve got 2-2-1/2 months before I can hit the links again.� I just might pay our indoor driving range a visit next week.� I also want to check out that new Nike square headed driver.� You know the one that guarantees you’ll shoot straighter and farther than ever before!� I suppose I’ll have to sell my other four “guaranteed longer” drivers, before I invest in another.� My wife is going to kill me if she finds out I’m even thinking about another club.� It’s our secret ok? Roy Stewart and Jerry Lands are my fellow golfers, and my partner Ed took the picture.� Ed “skinned” us alive, but then he always does! I put in for up north in the Lewiston area where I used to go.� Hunting them down here is alright, but nothing beats the atmosphere of the true up-north experience.� The comeback of the� turkey, in the state of Michigan, is nothing short of remarkable.� Just the other day Dave Liske (Luna Pier Cook) saw a turkey within the Monroe city limits. You can’t get any further south in Michigan than Monroe, and we have a viable turkey population county-wide.� The DNR deserves a pat on the back for the time and effort they’ve put into making the Eastern Wild Turkey a real success story in Michigan. 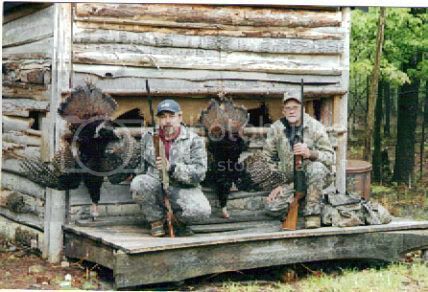 The above picture is of me and my friend Ron Marchese a few springs back.� We hunted just north of Bay City, about 25 miles, and both took Toms.� I hunted out of the permanent blind, while Ron had a portable ground blind, that worked to a tee.� Turkeys aren’t near as spooky as deer when it comes to putting a new piece of furniture in their living room!� I own three of the “doghouse” blinds, and hunt more from the ground than I do from a tree anymore.� Get em set up early, and the deer will get used to them, giving you the element of surprise! You only have three more days.� If you snooze you lose! This picture’s so old they didn’t have color film yet! Left to right is Tom Brown, Me, my oldest brother Randy, and Cliff Sasfy. The car belonged to me, and was a 1964 comet cyclone with a 289 cu. inch motor and Holly 4-barrel. I had installed a Racer Brown camshaft with solid lifters, and a 411 rear gear to give it more “gazoopa’s” off the line. I also had a set of 2″ dumps welded into the exhaust header, as I couldn’t afford after market headers at the time. The tires on the rear were Atlas Bucron’s with just the slightest bit of tread on the wide tire. My brother Randy was home on leave from the Marine Corps, so I let him drive my little comet at the Spring Nationals, held at Milan dragway. Randy was a Viet Nam veteran, and actually was scheduled to go back for another “stint” of ducking bullets. My car ran G-stock-automatic, and had 16 cars in it’s class. Randy blew their doors off! My friends ,Tom and Cliff, had done an excellent job of tuning this little black beast, and Randy was “break-torquing” it just right. When the tire smoke cleared we walked off the track as “Champions” of our class at a National event. We even got our name mentioned in Hot-Rod magizine! It was a thrill for me to see my Marine brother have such a good time, before he had to go back to the perilous unknown of warfare! That Spring of 1966 would prove to be my last one with my beloved comet, as I got drafted at the end of the year. I had to sell the car due to the substantial pay cut I was taking. I raced the car three more times that summer, and won every contest. The trophies are gone, the pictures tattered and torn, but the memories are alive and well, at least for the time being! Marine Sgt. Norman Randall Ansel returned home safe and sound, and at 63 years young, is still Marine Corps “fit!” SP/5 Michael Ansel never left the states, and upon discharge bought himself a nice little Plymouth Barracuda with a hi-po 273 engine. Here we go again! Younger brother Darryl also was called upon to serve, much to the dismay of the Viet-Cong. Sgt. Darryl Douglas Ansel distinguished himself in battle, and was awarded several medals for heroism. Darryl returned home safely, and has spent his entire career in law enforcement. Believe me when I say these are three sons who were thankful for the prayers of their parents! Whether in the jungles of Viet-Nam, or at the drag strip-we needed them! Joe Giarmo follow up. None of these guy’s will ever win a beauty contest, but you might think twice about “gettin in their face!” From left to right is me, Kelly Duffy, Frank Furnari, Todd Riggs, Joe, John Martin, and Ryan Wilburn. This picture was taken two years ago just after the opening of Joe’s Boxing Club at it’s new location in the Powerhouse Gym. All of the above are board members, coaches, and former boxers for Joe. 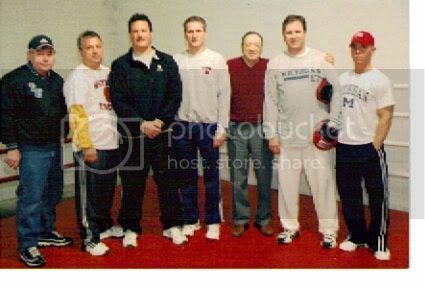 Todd Riggs (on the left of Joe) is the head coach now, and had quite a professional career out of the Kronk Gym in Detroit, until an injury forced him to retire. Ryan Wilburn (red hat) is the assistant coach, and has a couple professional bouts under his belt, along with two “toughman” appearances. Ryan’s step dad (Randy Goins) was one of Joe’s best, and I had the misfortune of sparring with him many moons ago. I did learn a “lesson” though, and that’s what’s important! These guy’s have donated their time and talent’s to help the youth of Monroe. There are even a few girls training under Todd and Ryan, and Chloe Kinsey is an awesome little fighter. She has won several matches and exhibitions, and is a coaches dream-she listens well! Joe’s will be putting on a boxing show at the Monroe County Community College on Feb. 9th. Jake Duffy and Dylon Minton are a couple of the boxers on the “card” for this exhibition. If you get a chance come support these kids, and the “club.” If you see Joe give him a hug, and thank him for caring. (Disclaimer) I am on the board, but helped coach very little, and never had an official bout. I did train with Joe for a couple years when I was in my late 20’s just to get “in shape!” My claim to fame is having the honor of working with Joe, at Ford Motor Company, in the skilled trades department. Joe is my good friend and mentor for which I am eternally grateful. The other guys in the picture are the backbone of the program, and a credit to our community. The name of this blog is “Hunting with Mike-from field to freezer and “in between!” From time to time I may write about a subject that has nothing to do with hunting; thus the “in between.” The above picture is of my grandson Kyle Pafford and my very good friend Joe Giarmo. 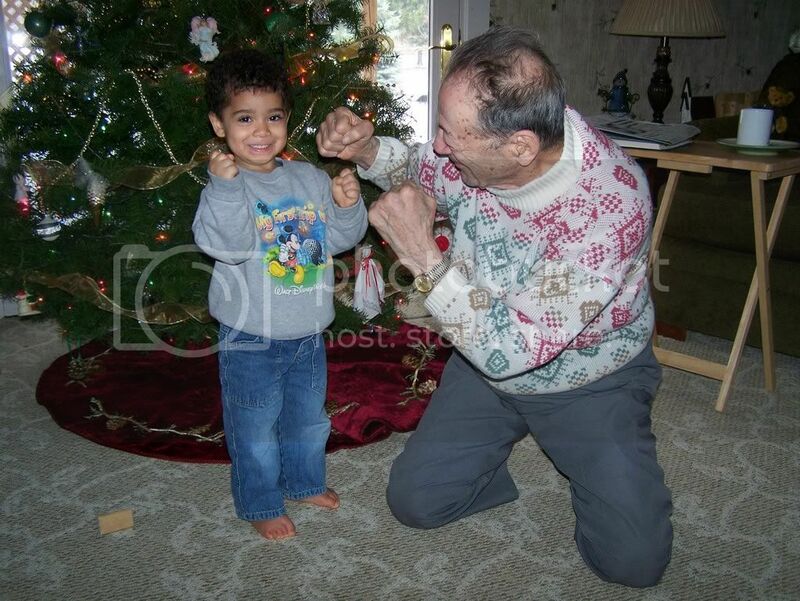 It’s no accident to snap a picture of Joe in a boxing pose, as he has trained, and coached, boxers for over 60 years. Joe is 91 years old, and still living the independent life. In fact I met him just a couple days ago at Tim Horton’s for coffee and a croissant. Joe’s wife Dorthy has been gone for almost 30 years, and Joe misses her dearly still! They had two children Antony (Tony) and Kay. 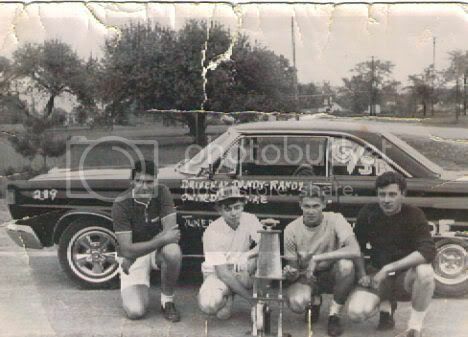 Tony was a top notch athlete for Monroe High School, and a champion golden gloves boxer. He passed away unexpectedly several years ago! Joe was an undefeated middleweight in his younger days, and started training fighters after his stint in Europe during World War II. Joe was one of five Giarmo brothers to serve this country during the “war to end all wars!” Now only Joe (the oldest) his brother “Jimmy” and his sister are left from this proverbial Italian family. Joe started training boxers in the basement of St. Joseph Catholic Church in Newport Michigan. Over the years he moved his “ring” many times, and for most of those years had it set up in his garage. Joe took in hundreds of “street” kids over the years, and gave them the skills and discipline they needed to make something of their lives. A few years back Joe’s daughter Kay honored her dad with a “Joe Giarmo Day” at the Knights of Columbus, and it was a sell out-over 600 people attended. Joe was once chosen as a trainer for the U.S. Olympic boxing team and worked with a young Kentucky kid named Cassius Clay. One of Joe’s Monroe fighters was also on that team by the name of Waymon Grey. Over the years Joe’s boxers took more than their share of boxing trophies, tournament, and titles. One fighter Joe had worked with is Bronco McKart (former middleweight world champion) who is still active in the sport. Joe’s “boys” are very dear to him, and not a day goes by when he doesn’t think of his “team!” Some of those young men are approaching their 70’s themselves, but Joe still considers them “his boys.” I can’t say as I know of any other person who has given so much of themselves to a community. Joe’s boxing club was primarily funded by Joe himself, and he always put the welfare of those kids above his own. Today we have in Monroe “Joe’s Boxing Club”that rents a portion of the “Powerhouse Gym.” Two of Joe’s “kids”now run the club. Todd Riggs (former pro) and Ryan Wilburn (boxing pro-toughman) now head up the stable of “young guns!” Joe still gives these young pugilist pointers, but he gets more enjoyment out of the constant hugs he gets when he goes to the gym. 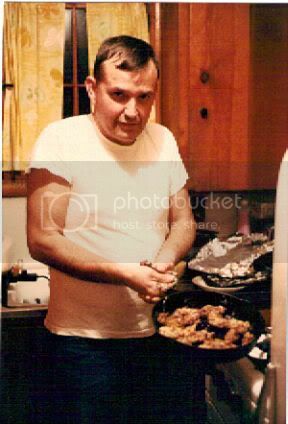 Joe practiced “tough love,” but he always tempered it with a fathers tenderness. Joe you are a hero’s hero, a mans man, and a exemplary example to all mankind. Thank you Joe for caring. The world is a much better place because of you, and I am blessed and honored to call you a friend. May God continue to abundantly bless you. Wild Game Dinners and Softball? This is a picture of our church softball team I played on, and managed for over 25 years.� The church along with Victory Flooring sponcered the team. 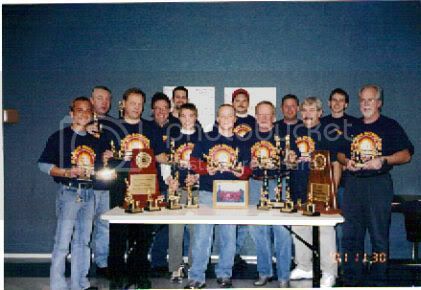 �Back in 2001 we had quite a season!� Monroe is “BIG” on softball, and we have a fantastic complex in Munson Park.� Four back to back diamonds, and a league director (Mark Reinhardt) who knows his job inside and out.� Eight of the thirteen guys in the picture are related to me, with three brothers, and my son being part of the team.� The guy on the far right is our Pastor Dr. John Piippo, who at 52 years old led the team in triples.� Pastor John is also a blogger for the Monroe Evening News and writes a blog called “Discovering The Real Jesus In Monroe.”� It’s worth a look if you get a chance. You may wonder “Where is he going with this?”� Well about twenty-nine� years ago we did our first wild-game dinner, at the church, to raise money for softball uniforms.� It was a huge success, and was well received by the community.� I always made sure I had, not only the norms., but the not-so-common also!� I’d have muskrat, buffalo, alligator, moose, elk, caribou, bear, pheasant, rabbit, squirrel, turkey, duck, deer, wild boar, and antelope.� We started including an auction, along with the dinner, and we were soon helping fund a church auditorium, as well as other causes.� Over the 15 years, we put this on, we raised over $130,000 dollars, and made alot of new friends in the community. Recently I have been asked to head up another dinner/auction to benefit our India missions.� Our Pastor Emeritus Joe Atkinson leads a team (yearly) for several weeks in India, teaching pastors our “Full Life In Christ” series, developed by Pastor Atkinson.� On top of that, a group of 400 pastors from Bangladesh wants us to bring the program to their impoverished nation.� The cost is staggering, and in order to facilitate such a mission, everone must put their hand to the plow!� I have asked that each family in the church donate at least one item for the auction, and we have a team searching for corporate sponsors as well.� Because of time restraints we are going to go with a simple meal of hot dogs and sloppy joes.� It’s been a few years since I have been involved in this type of fund raiser, and I’m really looking forward to an evening of fun and fellowship. Wild game dinners are a great way to reach out to the community of non hunters, and bring them along side us, in preserving our hunting heritage.� They are fun, inexpensive, and you get to meet some great people along the way.� If your thinking of putting one on, and need some help (advice) I’ll be more than glad to try and answer your questions. The Michigan Deer and Turkey Spectacular is fast approaching (Feb. 8, 9, 10 th. 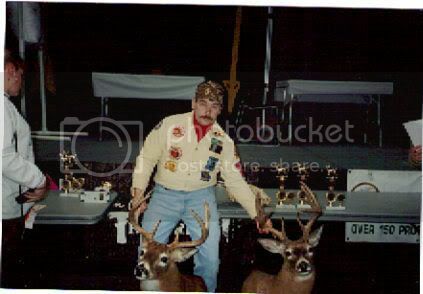 )� Again it will be held at the Lansing Center at 333 East Michigan Ave.� The above picture is from several years ago when I was fortunate enough to bring home the “gold!”� The two bucks I entered won “top” honors for deer harvested prior to the current year in the archery category.� The one on the right was a narrow (almost perfect) 10 pointer that scored 133 P&Y, and the other was a 8 pointer that scored 129 P&Y points.� I also entered my biggest black bear that took top honors with a skull size of 19 -6/16 P&Y inches.� We had a great time while we were there, and I highly recommend attending at least once in your lifetime. Also one of the main attractions is the display, and recognition, of Michigan’s best deer, bear, elk, and turkey’s.� Commemorative Bucks of Michigan will again be on hand to officially measure your trophy, and get it entered into their record books.� You will get to see hundreds of Michigan’s best wild game animals on display, both past and present!� If you have a big rack laying around the house, from the past, you might want to enter it into the “past years” category.� I’ve got one here from the late 50’s that I’m going to enter one of these years.� This is a great way to break up the winter blahs.� You will truly enjoy yourself, and you might even “book” that “hunt of a lifetime” while your there! That’s my ole rabbit hunting buddy Jack Richmond with a pan full of delicious snowshoe hare.� So far, this year, the snow has been more north and south of Monroe, so I’m still waiting for a good blanket of the white stuff.� I’ve got rabbits all over my neighborhood, but the neighbors frown on shooting their “pet” rabbits.� I live in the country, and have a woods just 150 yards behind my house that is full of rabbits as well as squirrels!� The owner of the woods doesn’t allow any hunting so the “critter” population helps feed the local foxes and coyotes! I do have a good recipe for rabbit, and will pass it along.� I have tried this one using butter for basting, but more recently I’ve tried bacon grease (saved drippings. )� I think I prefer the bacon, as it adds a real nice flavor to the rabbit.� Anyway here is what you’ll need.� Start with 1 cup of flour, and mix it with about 1/2 teaspoon of salt, and 1/2 teaspoon ground pepper.� You can also add some seasoning salt or garlic salt as you prefer.� About a 1/2 teaspoon of paprika or sweet basil can be added to the mix, along with 2 cups of bread crumbs.� Crackers will also work, but they have to be broken up very fine to get the right texture.� You are now ready to start the process of “gettin” dinnner on the table!� The rabbit should be quartered, and the bacon grease should be heated up.� Roll the rabbit pieces in the flour, pepper,salt, garlic, and paprika mixture.� Next use the melted bacon grease to coat the pieces, and then your ready for the bread crumbs and basil to be added.� I’ve tried frying it this way, but it is much better to bake it, and less messy also.� Place rabbit in a baking pan and put in preheated oven at 370 degrees.� Depending on the size of the rabbit each side should be baked for 30-45 minutes.� Use your own judgment here, as you don’t want to dry the meat out.� Once it starts getting brown check it for tenderness-then bona-petite!